Although I did not admit it to my friend, the prayer terrified me. I couldn’t imagine letting go of everything that I have and entrusting my life entirely to God. Despite my fears and anxieties, the prayer left an impression upon me and has remained with me ever since.I still wrestle with entrusting myself to the will of God. David Wells, author of The Reluctant Disciple, articulates well the root of the fear that so many of us have when it comes to completely giving ourselves to God. Regardless of my fear of God’s will and the demands that it may place upon me, there is something so incredibly attractive about submitting myself to the mercy and care of God. Perhaps it is because I grow weak when I try to control life. Or maybe I know deep down inside that true freedom can only be found in God. Today we celebrate the feast of St. Mary Magdalene. Although myths abound about her life, it is clear from the scriptures that Mary experienced true freedom and redemption in Jesus. We don’t know what her demons were, as we don’t know the demons that each of us struggles with, but we do know that she gave herself completely to Jesus. And for that, she became the exalted disciple, the one to whom Jesus reveals himself first after the Resurrection. 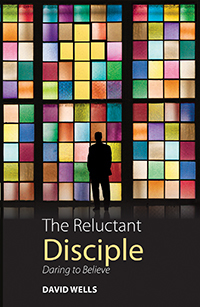 To read more on David Wells journey of faith, check out The Reluctant Disciple. David Wells, a teacher and a father of three kids from the UK, shares with us his own path to discipleship. He is a fantastic storyteller: wry, funny, self-deprecating and down to earth. The Reluctant Disciple is ideal for study groups and people on retreat but it’s just as easy to pick up the book off the shelf and enjoy it straight through.